Olive Oil Wars: A Sunny Business with Shady Practices. Read the Label, Carefully. The urge to indulge oneself in the delights of everything Provence is symptomatic of the impoverished assumption that everything in the region is authentic, e.g. made in Provence. Not so. Market day somewhere in Provence. You approach a stand displaying a sunburst of colors: the many hues of locally-grown olives, the warm beige of honey, the black night of tapenade, the deep ruby red of cherry or strawberry preserves. You grab that bottle of olive oil with a pretty provencale design. NPR ran an interview with Tom Mueller, an Italy-based contributor to the New Yorker and the author of Extra Virginity: The Sublime and Scandalous World of Olive Oil, which documents a sunny business with shady practices. PVB’s survey of olive oils sold in the Vaucluse resonates with Mueller’s what’s-in-that-olive-bottle warning. A French TV Channel 5 documentary ripped into the olive oil biz and the slights-of-hand and dodgy product labeling that infantalize consumers. The FR5 video with sub-titles would be riveting entertainment on Air France’s inbound flights rather than those dull movies that you never dared place in your Netflix queue. French regulations demand that the origin of the olive oil must appear on the bottle. Look closely. At times, such info appears in mouse type. 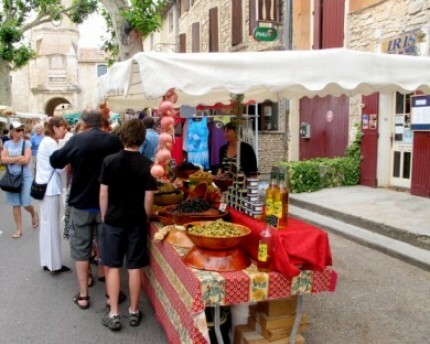 The FR5 sleuths embarrassed one shady vendor at a market in Aix-en-Provence who was selling olive oil from Spain. Take the generic phrase “a product of the European Union” that appears on the back-of-the-bottle label of the popular French supermarket brand Puget. Origin of this olive oil: Spain. 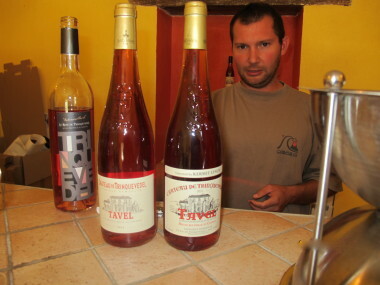 The French company refused an interview and visit from the truculent FR5 reporters at their bottling facility in the south of France. No different in Italy as Mueller surmises that “4 out of 10 bottles that say Italian olive oil are not actually Italian olive oil.” The gimmick: import olive oil from another country and have it packed in Italy, or ship it via Italy. These are not illegal practices mind you, but the consumer is being defrauded. A quick primer. Virgin olive oil is harvested by hand or machine to preserve the integrity of the fruit, and undergoes no chemical treatment. In the bottle, virgin olive oil possesses an acidity of not more than two grams per 100 grams; extra virgin olive oil has not more than .8 grams per 100 grams of acidity. Spain produces about a third of world production. 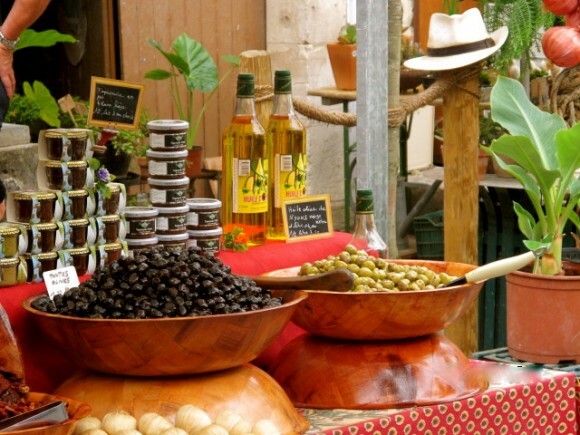 Boutique olive oils in Provence can run from 15 to 40 euros a liter. 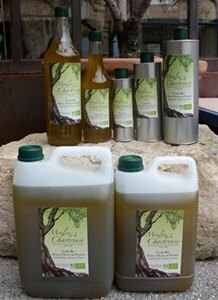 Pictured above is an authentic Olive Oil “etiquette”: Huile d’Olive Vierge, Recolté et Mis en Bouteille par le Producteur Catherine et Serge Constant, Earl La Rambaude, 339, Chemin de Saint-Roch 84210 Saint-Didier, Origine France. 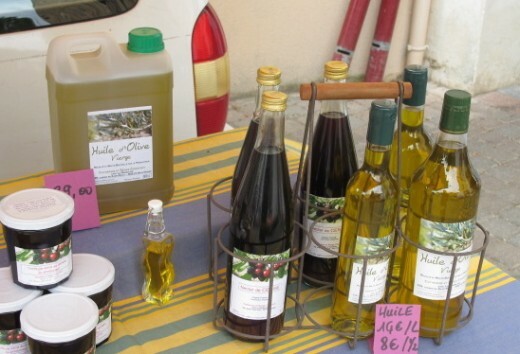 This olive oil is on sale at the Monday Morning Market in the village of Saint-Didier. Repeat: Inspect the label, carefully at a market or a shop / supermarket to verify the producer and the origin of the olive oil before purchasing. So if you have come all this way, why not splurge for the real Provencal stuff and buy direct from a producer like Catherine and Serge Constant. This entry was posted in Food and tagged Food, olive oil, Saint-Didier. Bookmark the permalink.